What Day Of The Week Is December 11? 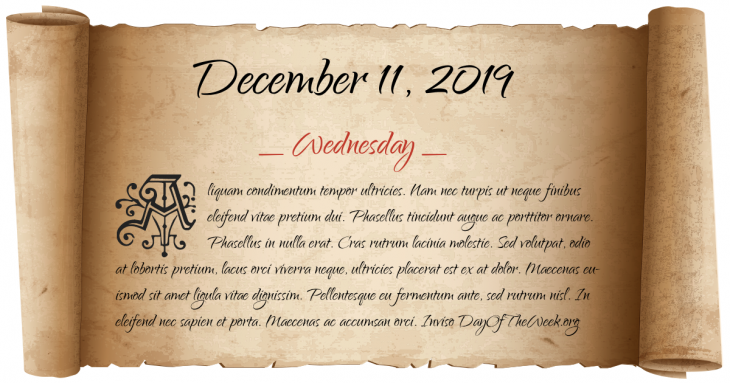 December 11, 2019 is the 345th day of the year 2019 in the Gregorian calendar. There are 20 days remaining until the end of the year. The day of the week is Wednesday. The University of North Carolina is chartered by the North Carolina General Assembly. Brazilians defeat Paraguayans at the Battle of Avaí during the War of the Triple Alliance. The British Parliament enacts the Statute of Westminster 1931, establishing legislative equality between the self-governing dominions of the Commonwealth of Australia, the Dominion of Canada, the Irish Free State, Dominion of Newfoundland, the Dominion of New Zealand, and the Union of South Africa. Second Italo-Abyssinian War: Italy leaves the League of Nations. The United Nations passes General Assembly Resolution 194, which established and defined the role of the United Nations Conciliation Commission as an organization to facilitate peace in the British Mandate for Palestine. Arthur Lucas, convicted of murder, is the last person to be executed in Canada. The Comprehensive Environmental Response, Compensation, and Liability Act, also known as CERCLA or Superfund, is enacted by the U.S. Congress. Cronulla riots: Thousands of White Australians demonstrate against ethnic violence resulting in a riot against anyone thought to be Lebanese (and many who are not) in Cronulla Sydney. These are followed up by retaliatory ethnic attacks on Cronulla. Felipe Calderon Hinojosa, the president of Mexico, launches a military-led offensive to put down the drug cartel violence in the state of Michoacan. This effort is often regarded as the first event in the Mexican Drug War. Who were born on December 11?